Casio G-Shock GW7900B-1 - With the never ending pursuit of toughness and technology, G-Shock introduces a Solar Atomic addition to the tough and rugged G-Rescue series. Already iconic for its four point protection design,large case, oversized buttons, tide & moon graphs, this new model keeps the same design philosophy of allowing for high functionality and operability, in the harshest conditions, even while wearing gloves. With its monotone, grey IP coloring and aperture band design, this new addition to the G-Rescue series not only looks tough, it also very comfortable to wear. 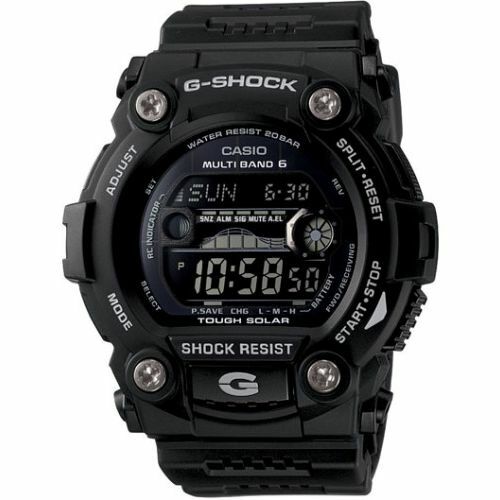 Casio G-Shock GW7900B-1 - SAME DAY - FREE SHIPPING always at TQ Diamonds.com! YOUR WARRANTY CARD IS VALID ONLY FOR SERVICE IN THE COUNTRY OF PURCHASE. This product, except consumables or articles with limited resistance (e.g. battery, band, case), is warranted to the original purchaser to be free from defects of quality at the time of delivery for a period of one year from the date of purchase ("warranty period"). During the warranty period, and upon proof of purchase, the product will be repaired using CASIO reconditioned replacement parts or the product will be replaced with the same or a similar reconditioned replacement model within a reasonable period of time. To obtain these warranty services, please take or send the product, postage paid, with a copy of your sales receipt or other proof of purchase that shows the date of purchase, to a CASIO Service Center such as TQ Diamonds. There will be no parts or labor charge to you for valid warranty services. This warranty is void if your watch was purchased from an online auction site or has been damaged by unauthorized service, negligence or accident, or other causes not relating to defective material or workmanship. Don't risk losing your warranty buying a watch from an online auction site that can't offer a valid warranty! TQ Diamonds is your #1 authorized dealer.